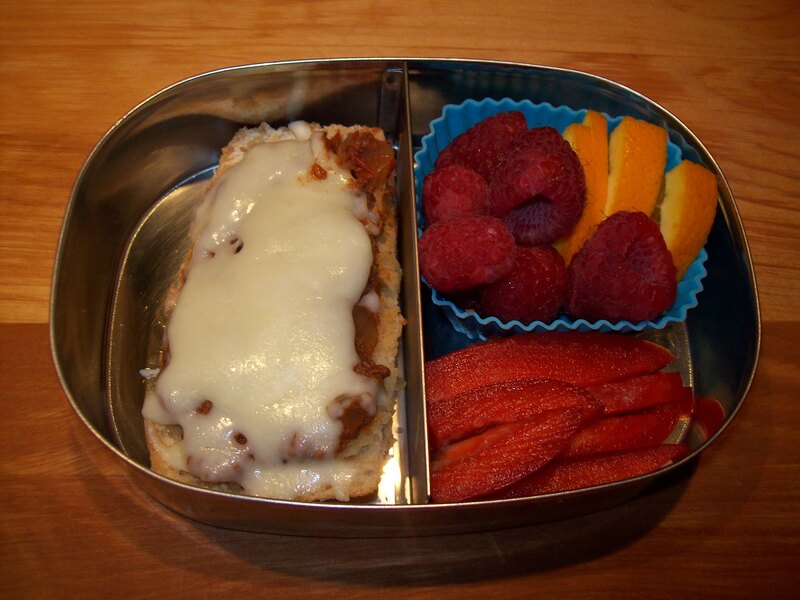 Sometimes –no, most of the time — I find that repurposing leftovers is really the only way my kids are going to get a fast, tasty, and healthy lunch at school. I always make dinners with half my mind towards what I can do with any scraps that remain. One of the best dinner items I’ve found for the lunch-packing arsenal is, without question, leftover spaghetti sauce, because it can be used to make pizzas, pasta, and even soups in minutes. Pull the interior of the bread out of the strips, leaving a 1/2 inch border. Fill the hollow you’ve made with 1/4 cup of the meat sauce, top with 1/4 cup of shredded cheese, and put the pizza strips into a toaster oven. Toast until the cheese is melted and bubbly, about 5 minutes.